JOHNSON’S GHUT, Tortola, VI- It is unclear whether the car toppled whilst being driven or fell from a road above, but the presence of the overturned vehicle on the Johnson’s Ghut Road, on the main island of Tortola, for the past two days is causing some concern. 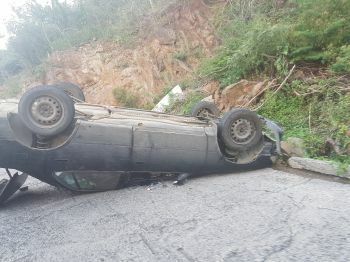 The car, with number plate PV 25269, was first spotted overturned at that location on February 1, 2018. 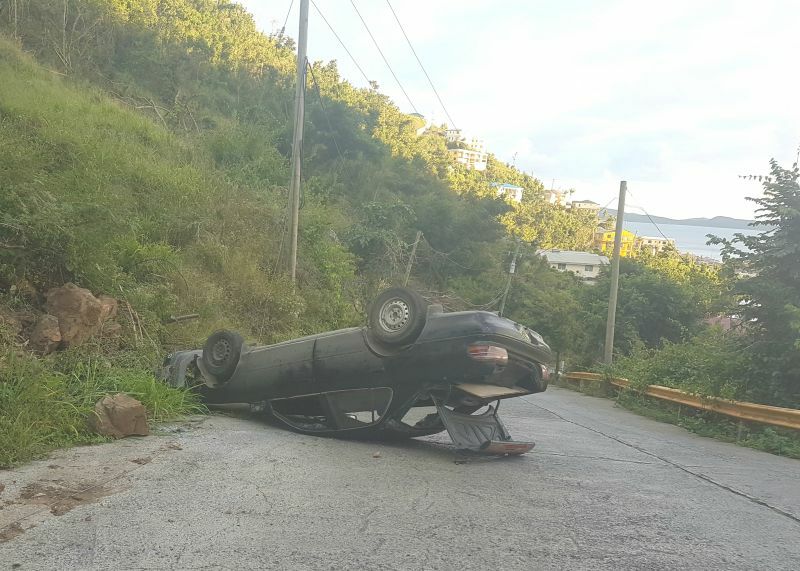 According to residents, it is at the same place where an accident occurred over a week ago, where a car ended up toppling as well. “My concern is that it is black [so] unless you know it is there some gazing person shooting down the hill may not have time to slow down,” a concerned resident, who lives close by, stated. “Do we need to tell the Commissioner of Police [Michael B. Matthews] that the RVIPF needs a flatbed added to their fleet to move these. That should be included in the £1.2M,” the resident added. Police Information Officer Diane L. Drayton, up to the time of publication, did not respond to our queries on the overturned car. Instead of making laws for themselves the politician should enact laws for the country. By that I mean for the amount of vehicles left for days some times weeks abandon on the roads, there should be a minimum of 24hrs free time for any vehicle to be left unattended. Last time I checked some kind was donated to us I believe by the UK ( a flatbed), I remember seeing GV plates on it... go check Solid Waste Dept. This looks like a serious accident. Maybe the driver is in the hospital and is currently not in a position to arrange for the vehicle to be moved. Perhaps a concerned citizen or someone else can volunteer to take it to a dump? You know the roads are bad no doubt and I dont know the cause of this accident but sometimes when its wet i am driving down a hill in low or 2nd in 4wheel drive and then you see some of these impatient drivers pass you by speeding down hill without 4wheel high or even self low gear. To dd you are such a idiot, i have to pass that area where the accident is everyday and it is very very dangerous, I pass there tonight and if you don't try and drive very slow passing the vehicle you can hit it, come on if it was blocking you and you couldn't pass I am sure you would want it moved right, smh some people are so inconsiderate. It's amazing how the police have to attend every tiny fender bender before vehicles are moved, yet this car remains where it is 5 days later.